Wow she looks so cool. I love the layering. I really love the way the fabrics drapes from her body. I also love the way that she’s paired different patterns. Visually, it’s interesting. Are these fashions that have appear on your page lately the offspring of twerk? Such a great look and photo! lovin her coat! Loving this picture! Great colors and focus! Wow the proportions and the graceful flow of her layering is awesome! Your photos make me want to go back to New York so badly! Love it. Typical downtown NYC. I really like this lovely outfits! Love the layering and draping! So serene. 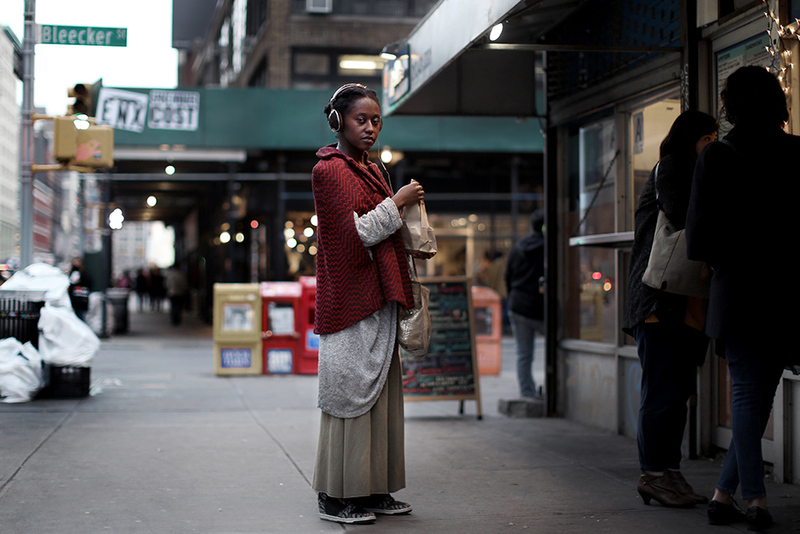 Wonder what she’s listening to in her own layered and pretty little world! Pantone released a behind-the-scenes look at the process of creating the color of the year on their instagram, looks really cool! I wonder if you would say this if she was white? ^^ That’s exactly what I was thinking! I see lots of white people dressed just like her and receive amazing comments, so she looks amazing and comfortable with awesome headphones!!!! She has style on her own … with no need to refer to trends, in-labels etc. Her style is lovely and individual. I love the draping and mix of fabrics. Anyone can be fashionable, but she has style. I wish young women in my town would take note. It’s raining skinny jeans and Uggs here. I have been following your blog for several years now. I always liked looking at your photos, at the clothes, the colors, the textures, the mixtures, the new trends, the elegance of italian men… but lately something changed. Lately I am seeing something more. the colors, the brilliance of style are still here and the comments of your followers are still the same. But the recent photos are not just ‘nice’ and technically perfect. what changed is the “regard” of the people in your photos. suddenly, the portraits are not about fashion, they are about the person’s essence, about something deep and beautiful. You do not look at them in the same way you used to. at least it seems to me. so, from my little island and with my keyboard I am humbly saying to Scott Schuman, Congrats! Not everybody could pull off a melange of styles, colors, patterns etc. But she just stares at the camera and says, “I look GOOD.” And you know? She’s right. Nice shot. Wonder what she is listening to…probably a kind of “oontz, ping! ooontz, oooooonnnttz, ping! ” house music–some critical, indelible, crude headphone masterpiece that makes her mind settle and eyes scroll down to half-mast while she stands static in aural ecstasy….mmmm! That layering and those headphones makes this look effortlessly cool! Your pictures make me think that NY is a sad city. I don’t know where it comes from. Dark even when the sun shines. Its not the Mediterranean. Scott captures it well. Its a city of contrasts.